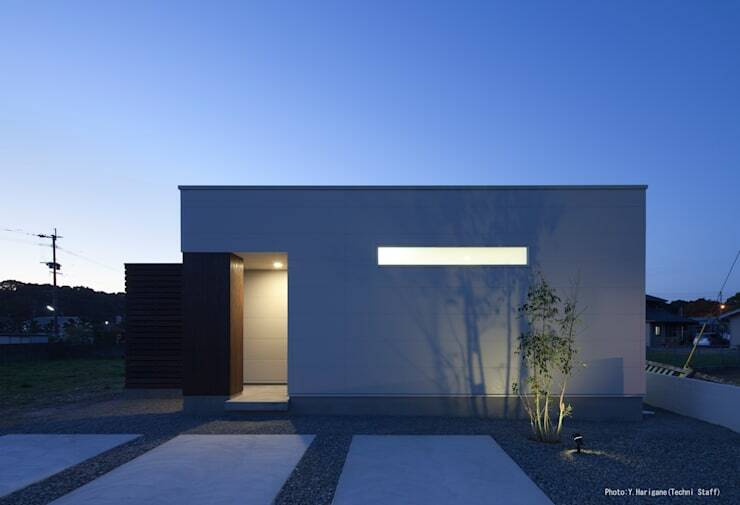 This beautiful abode, located in Japan, showcases minimalistic design at its finest, with the striking contrast of its simple facade drawing focus within a traditional neighbourhood. 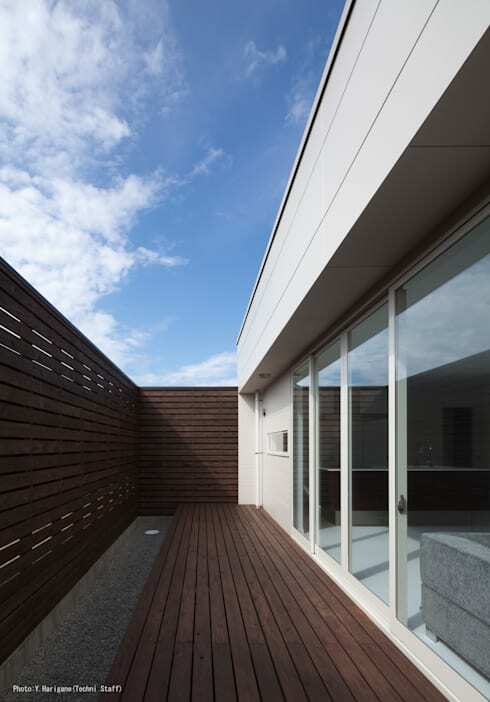 The product of Kama's Matsuoka Architects, this home impresses with its clean lines and smooth surfaces, with its flat facade of grey concrete and timber slats earning the nickname 'The Plate House' from its designers. Upon entry the Plate House incorporates multiple hints contemporary style, with the deep finish of its wooden fixtures contrasting beautifully against white flooring, walls and ceilings and the hints of silver found throughout the kitchen. The bathroom adds a sense of luxury to the abode, with white, marble flooring and twin sink units evoking a mature, sophisticated appeal, and a courtyard has been included for outdoor living, decked in the same dark timber slats as the home's facade. This house presents a beautiful, minimalistic design, staying true to the understated simplicity of Japanese architecture but with a contemporary edge. It's the perfect abode for those drawn to clean lines and subtle hints of luxury. Take a tour below and tell us what you think! 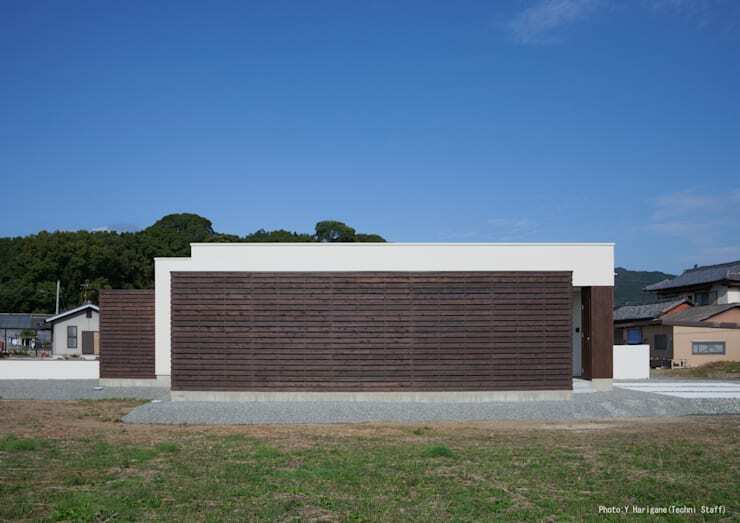 The facade of the dwelling is simple and intriguing, with the cool tone of its concrete walls peering out from behind the dark tones of its horizontal wooden slats. The abode appears both minimalistic and contemporary, with its simple shape and exterior drawing focus within a neighbourhood characterised by traditional structures. An expanse of grey gravel borders the home, creating a striking delineation between this novel creation and the casual garden beyond. The interior of the home echoes its minimalistic facade, with the dazzling white of its floor, walls and ceilings grounded by the deep tones of its timber fixtures. 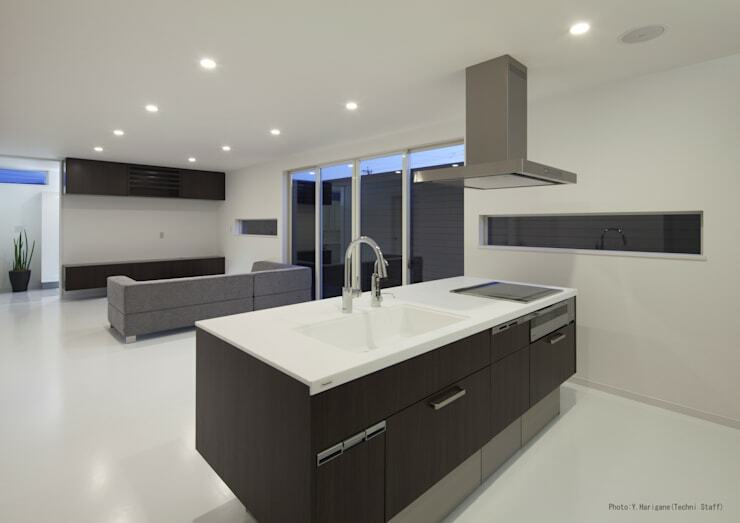 This generous kitchen space houses a large island bench, presenting a contemporary and sophisticated design feature with its crisp lines and hints of stainless steel and silver. A minimalistic, grey sofa sections the living area, providing a simple, comfortable vantage upon which to relax and recline. The bathroom of the home is modern and pristine, with its white finishes and marble floors combining to create a stylish and luxurious aesthetic. 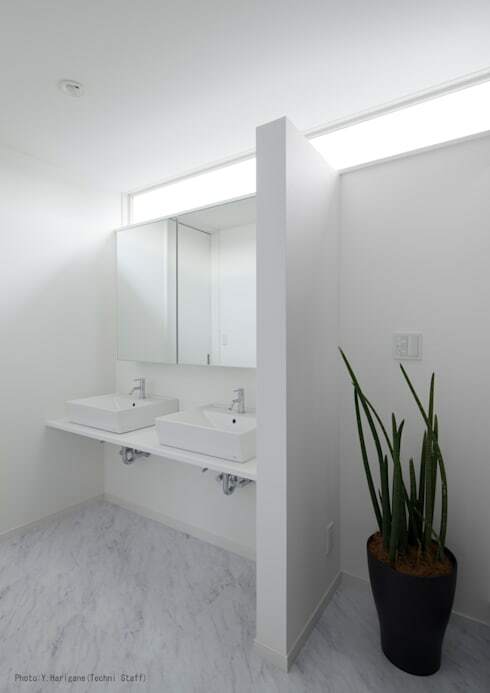 Twin sink units in front of a mirrored cabinet infuse the space with a sense of maturity and sophistication, while a glass panel beneath the ceiling invites natural light to illuminate the room. A simple, green succulent stands sentinel by the bathroom partition, adding a refreshing element of nature to the decoration and providing a colour contrast amidst the dazzling, white decor. Beyond the living areas rests this lengthy and spacious courtyard, constructed of the same striking timber which borders the home's exterior. Expansive, glass sliding doors can fully open to amalgamate the spaces for indoor and outdoor living, while a shallow raft of grey gravel provides a textural contrast within the courtyard, in keeping within the cool stones streaming around the exterior of the home. After dark this abode truly shines in its simple sophistication, with the facade bathed in streams of light, both from the interior and exterior of the home. The lighting showcases a glowing, minimalistic structure, and beautifully highlights the contrast between the smooth, grey concrete and deep timber constructing the facade. Surrounding the home streams the pool of grey gravel, with a simple tree and reams of smooth concrete resting in contrast against the coarse rocks. For another example of a stunning home with a crisp, clean facade, have a look at The White Box House and get inspired! What do you think of minimalistic architecture? Tell us your thoughts below.